Movie Review: Ridley Scott’s “The Martian” is a good, often funny, sci-fi flick, but not a spectacular one. Visually and technically striking, the film left me a bit wobbly due to a strained plot, which contains a rescue beyond the bounds of imagination, an unlikely collaboration between the NASA and the China National Space Agency, and a farfetched new way of growing potatoes on Mars (imagine!). However, if we close our eyes to its, perhaps too speculative, plot’s stratagems and schemes, it's still possible to find a handful of breathtaking moments to enjoy. The screenwriter, Drew Goddard, who had already disclosed his proneness to unlimited fantasy in past movies such as “World War Z” and “Cloverfield”, based himself on the Andy Weir’s 2011 novel of the same name. 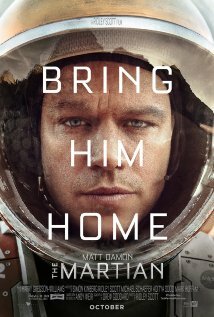 The American astronaut, Mark Watney (Matt Damon), gets accidentally stranded on Mars, after an operation that ended up aborted under a severe dust storm. On Martian soil, Mark is gravely wounded, loses his senses, and gets lost from the rest of the crew. The brave commander, Melissa Lewis (Jessica Chastain), informed by her fellow astronauts that Mark is dead, gives the order to return immediately to the spaceship and abandon the planet, not taking the risk of losing another crew-mate. When the world thought Mark was dead, he surprises everybody, not only giving signs of life (confirmed by satellite images), but also proving he’s healthy and making use of his botanical skills to prepare an artificial piece of land where he’ll try to grow potatoes. This way, he could last three more years until the next scheduled mission to the planet. The general problems in these cases start to appear, but the extremely versatile Mark never loses his good disposition and faith. On the Earth, the NASA is ruminating on the best way to bring Mark back home. Heading the operations are the optimistic director Teddy Sanders (Jeff Daniels) and his expeditious right-arm and mission director, Vincent Kapoor (Chiwetel Ejiofor). Ridley Scott feels comfortable within a genre that he knows extremely well. The Polish cinematographer, Dariusz Wolski, who had worked with Mr. Scott in “Prometheus”, does much better than Harry Gregson-Williams in the music department. Slightly overlong and just pinching in terms of excitement, “The Martial”, though watchable, fails to be the masterpiece that Mr. Scott has envisioned.